My fiancé just told me that these Chicken Enchilada Stuffed Shells are his favorite thing I’ve ever made him. That’s a pretty rave review if I do say so myself! I love Mexican food, so I’m always looking for new ways to serve it and once this idea popped into my head I knew it was going to be a winner. I mean, who doesn’t love pasta and enchiladas? Together = pure gold. 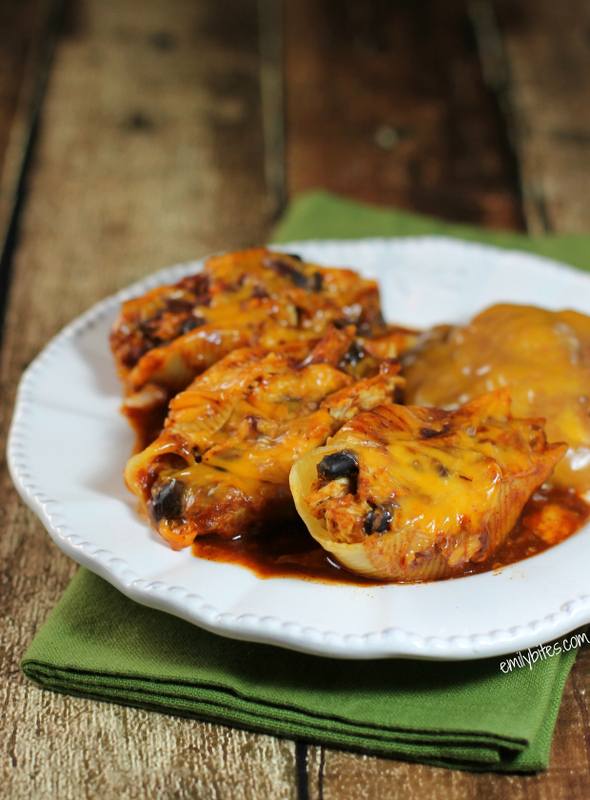 These pasta shells are stuffed to the brim with seasoned chicken, sharp cheddar and hearty black beans and smothered underneath a kickin’ enchilada sauce and more cheesy goodness. The result is filling and tasty and a perfect comfort food dish to serve your family. This recipe isn’t difficult, but there is some time involved, so I suggest making it on the weekend to serve or eat throughout the week. I listed 3 shells as the serving size, but that’s a pretty hearty serving size, so if you’re serving it with a filling side dish (refried beans, veggies, rice, etc), you may be plenty satisfied with 2 shells. While the chicken is cooking, boil water and cook the pasta shells according to package directions. Drain and set aside to cool. Remove the lid from the pan and transfer the chicken breasts to a cutting board, leaving the sauce. Add the can of enchilada sauce to the sauce in the pan and stir to combine. Reduce heat to low and recover until needed. Shred the chicken using two forks and transfer it to a large bowl. Add ½ cup (2 ounces) of the shredded cheddar, the black beans and ½ cup of the sauce from the pan. Stir until well combined. Spread ½ cup of the sauce from the pan across the bottom of the prepared baking dish from step one. Using the chicken filling from step 5, stuff the cooled pasta shells evenly with filling and place them on top of the sauce in the prepared baking dish. Once the shells are in place, pour the remainder of the sauce from the pan over the tops of the stuffed shells and follow with the remaining shredded cheddar cheese. Place in the oven and bake for 30 minutes until the dish is heated through and the cheese is melted. This is pretty sad, but I stalk your site daily…I can’t even wait for my emails to tell me you’ve posted a new recipe! I always get pretty excited when the heading comes up and I see something new! This recipe looks delish, and it’s going to be added to our menu for next week! Can’t wait to try it! That’s not sad, it makes me happy! 🙂 Once wedding planning is over and I get back from my honeymoon I should have more time to post recipes more often, so keep your eyes peeled! Thanks so much for your nice comment. I hope you love these! Can you use pre-shredded chicken to cut down on time? Yes, how much pre-cooked chicken would equal the raw chicken in this recipe? I didn’t measure post-cooking, but I would estimate about 3 cups shredded, cooked chicken. This looks fantastic! 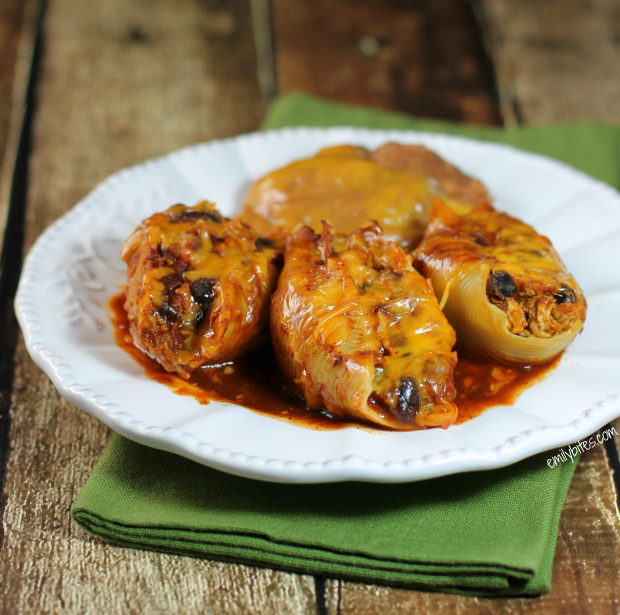 Taking the best of stuffed shells and enchiladas together. I was just thinking that I wanted to make enchiladas, but I’m not a huge fan of corn tortillas. Thanks! Emily I just want to say I LOVE your recipes. I have made so many but by far my fav is your Chicken Tortilla Soup – its always stocked in my freezer. I make double batches at a time. Thanks for all the great recipes you provide! Never mind, now the Pin link is working! I am SO excited to try this out tomorrow. My husband has loved all your recipes so far but is very excited about this one. Oh man, this is right up my alley! 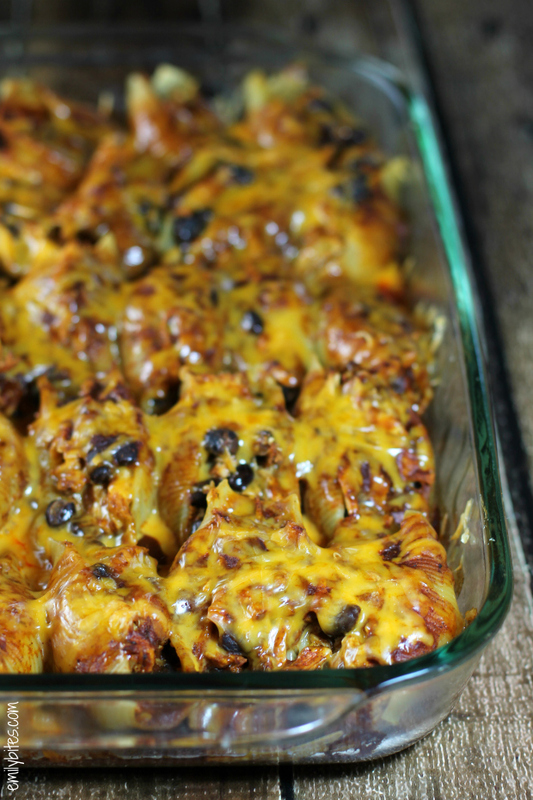 I have to tell you that your revised bubble up enchilada casserole helped me to lose 5.6 lbs. this week! I love the flavor of it and with green onions and ff sour cream on top it is divine. I was going to make it again today, but now I don’t know – this looks good too, dang it! Making these for dinner tonight… will have enough to freeze for lunches at work. Yum-o! Made this with ground turkey to save time and was fantastic. Cooked turkey and onions together and put all other sauce ingredients in a bowl. The whole family loved it. I made this last night, with company visiting, and it was a hit! Thanks so much for a delicious recipe! As another poster suggested, I might try with ground turkey next time, although we loved it with the chicken breasts! Hi, Emily! These are absolutely delicious. For my family, the best of both worlds. We are Italian and love our pasta and we also love Mexican food. I didn’t have chicken breasts but I did have ground turkey. I, too, cooked the turkey and onions together and then mixed in the sauce ingredients. I froze the extras and they were delicious as well. Thanks again, Emily. OMG!!! I made this last week. It took a little bit to put together. but so worth it and very filling…. Thanks for another great recipe. This recipe was delicious! However, it took a lot longer than I was expecting, between the simmering and the baking. By the time I was ready to “stuff” the shells I got a little lazy, and so it was more of a shell casserole. Next time I might try to use ziti instead. Looking forward to the leftovers! Oh. Wow. These were amazing. I cheated a little bit 🙂 – I put the chicken breasts in a crock pot with 16 oz of pasta sauce (I used Trader Joes marinara – very low points) and then followed the instructions as written. Delicious. Will make again for sure! I love the flavor of the enchilada sauce. WOW! This recipe was amazing! The whole family loved it! I did not use the beans as no one is a fan….but it was still awesome! It did take a little longer than I planned, but it was worth it! Next time, I think I’ll cook the chicken in the crockpot ahead of time. Thanks so much for the post! I’ve had this on my “to cook” list for a while and just got around to it. I modified and did the first two steps in a slow cooker. Then I just followed the rest of the steps as written. It turned out great! Made it a meal that was easy enough to do on a weeknight. It was a hit. Thanks! Would I be able to make them and refrigerate and then pop it in the following day? I’m obsessed with these but too time consuming for an evening after work. Thanks!! None of your recipes have let me down yet! And let me tell you; I've made a TON!!! Do you think I could do the chicken in a crock pit first? Making these again tonight – my favourite recipe of all time!